I don't know if anyone else saw the same bits and pieces in fashion magazines, but apparently butterfly print is a thing. Or at least, it will be. I don't know, but when it catches hold, I'll be ready with this cute new blouse from Oasap! Plus, you know how I am with statement jewelry, so this Egyptian-like stranded necklace is perfection. I can't get over how bold it is! The only thing is I have to be careful when I hang it up so the strands don't get tangles up in a gnarly web of gold. Ever since this semester started, I feel like I haven't had a chance to breathe. Its just been bam, bam, bam, rush from one thing to another. A break in between class? Better do an office hour for Senate. Oh, you have a solid hour to yourself? Go attend that Business Club meeting you've been meaning to do. Then after three PE classes in a row, better go home and shower so you don't scare everyone out of the Art Building once Drawing class starts - which is in half an hour. Speaking of a packed schedule, I had a fun time and learned a lot at the leadership retreat I went to with Senate and some other councils from my college. We were all split up and got to interact with new groups, so being my awkwardly social self, I enjoyed it. After a few speakers and activities in the morning, we all headed down to the Snake River to kayak and paddleboard! It was so relaxing yet energizing. So I got to go paddleboarding for the first time ever, and now I'm interested enough in it to start checking out equipment for my own use next summer. Seriously, that is the life right there. Just hop on a paddleboard and float out on a river for a bit. I joined a group that was hanging out under the Perrine Bridge and we watched about 10 base jumpers take that frightening leap into the air. Each one landed safely in the targeted area thankfully, but it was quite the sight to see! Lying on my back, floating in the water under the warm sun, and surrounded by new friends, I felt a spark of hope in my chest that this year could shape up to be the one I've been looking forward to. One that will have its struggles, of course, but also one where new experiences and friendships could be had. Your blog is so cool ! !So i wondering if we could follow each other? Love your shirt! It's very pretty! such a pretty look, your style is flawless! Q: Is the dark tone in your pants and shirt navy or black? Couldn't determine. Yet either way = awe.some. Oh and am thrillllllled beyond thrillllled with my little $5 Bomber. Yahooo! Ok, is butterfly print a thing? Cuz I've been admiring it from afar for a while now... I need to actually buy something with butterflies! Haha. I love this top of yours, the gold on a black canvas is so pretty and I love the pop of red with those fun booties! Oh I love this look very cool!!!! That necklace is way cool. I hope things calm down for you a little bit soon. You needa break! Time for a sa day, it sounds like. Cute outfit, love those boots. When I was in Austin recently the hotel had a river next to it that people were paddle boating in. It did look pretty relaxing!! The metallic butterfly print is divine on that blouse! And I have been wanting to try paddleboarding for a while now.. it's good to hear that you enjoyed it. I know some people think it's boring, but I think it'd be a great work out and relaxing at the same time. I adore you in a ponytail! you should do it more often for the blog haha also, those boots are killer! I want something with a butterfly print. I didn't know they are going to be trendy. P.s. Your boots are killer! I hope you can survive with your crazy schedule and be strong. You seem to have a really full schedule but it all sounds really interesting! The blouse is so, so pretty - I love the golden butterflies! Just lovely. I love the boots hun! Very glad to hear butterfly print is back in - I shall continue to wear my butterfly print dress, knowing it's trendy again, haha. Your leadership retreat sounds like a lot of fun, and a good break from all the business of school. oh, what a cute blouse that is! and it goes especially well with all the other golden accents you are wearing here. gosh I'm really starting to like golden accessories :P (I used to completely dislike them before). your boots are amazing too, by the way. and I enjoyed reading about your new adventures. good luck with everything, Linda :) oh and I totally feel you when it comes to this "bam, bam, bam" thing. lately I've been feeling exactly the same way! Cute print on that top and I love those jeans! That shirt is so beautiful - the butterflies are so delicate! Hahaha, you sound like you're so busy, Miss Linda! But I'm sure you're learning lots and having fun. Man, three gym classes in a row... yeah, that's definitely sure to scare away some art kids. ;) But I know what you mean by the bam, bam, bam. My classes run from 9 or 11 in the morning until 5 or 6 at night with tiny little breaks inbetween. I just had to pack snacks! Larabars and apples for the win! Ohhh my, this shirt is magical. I love gold and black together... and I love that you described your necklace as Egyptian-esque, because that's definitely what I saw in it, too. YOU'RE LOOKIN' CUTE, LINDA! Even if you are busy as crap. Happy hump day! SURVIVE THE WEEK! those boots are cute, and ya butterfly prints are pretty for sure! What a cute outfit! I love the shirt and the necklace! Hi sweetheart.. I appreciate you stopping by and lending me your kind remarks. Love the pretty butterfly blouse and the necklace beautifully accents the gold tones. The boots are amazing, love them. Things sound so hectic and I admire that you find time for it all. Paddleboarding sounds fun. Those boots! I LOVE. Great outfit. The pop of color is perfect. May I say, babe, that your booties are fierce. You look really hot! I love your butterfly shirt and those booties! I am dying for those booties, so cute!! I'm not sure if I can dig butterfly print but I've also noticed it pop up here and there too. I hope this doesn't become a huge 'thing' like neon and stuff LOL. And paddle boarding! I've wanted to do that for ages but surf boards and moi do not mix! I can never stay afloat on one so I'm pretty sure me trying to stand on one will end disastrously! Butterfly print is the bomb! I have a shirt that has butterflies on it that I describe as "Lisa Frank threw up on a shirt." I love the gold of your butterflies - so unique! OMG, I love your blouse!!! and pants, and necklace and bag...! So cute! And once again those boots are stunning! Love the print on that blouse!!! Love the unique butterfly top! BTW I feel like we would be best friends if we lived near each other, lol. I totally know what you mean about having a packed schedule- I dance for 15 hours a week and I have four more rigorous classes on top of that! Hopefully we can survive this crazy year together! 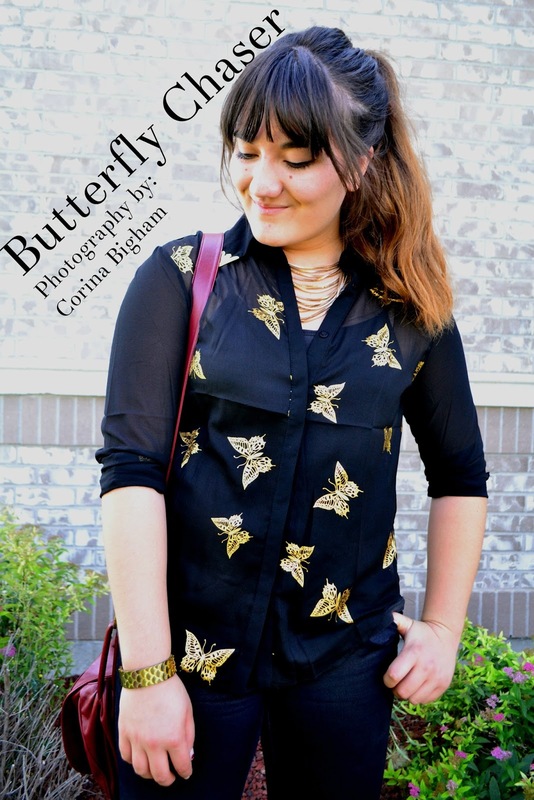 That butterfly blouse is so cool - I love the burgundy details too! I am in love with this blouse! It's so cute and lovely! At first, I thought they were coming right off the shirt... it looks so cool! that is a lovely butterfly printed top!! LOVE the gold details of your outfit; the print, the necklace and your buckles of your boots :) very Chic Linda!